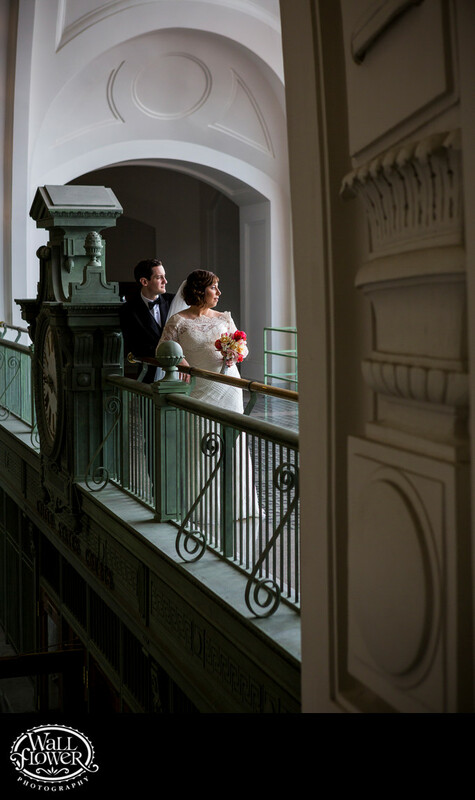 Union Station, a federal courthouse and event venue in Tacoma, Washington, offers a terrific contradiction of photo opportunities for wedding portraits. As an ornate, historic former train depot, it has some lovely architectural details. Yet, it also contains five major art installations by Dale Chihuly, the world-famous glass artist who is from Tacoma. For this portrait, I chose to feature the architecture, shooting at an unusual angle to capture the couple framed by the dark archway in the background, with their faces illuminated by the window light that they are gazing toward.